I've always wanted to be part of a book club. I was an English Literature major in college, and I spent 15 out of my 18 hours per semester studying, dissecting, discussing and interpreting novels with professors and classmates. It's been years since graduation, but I was born with an intense desire to mull over the written word and I'll drag whoever has ears (eyes, in this case) down with me. These days, I work writing ad copy for an e-commerce company, meaning that I sit at a desk and stare at the Internet all day, and the tendency to write, read and think in advertising clips can be quieted by putting bound paper in hand and trading the digital glow for black text on honest-to-goodness bleached trees. 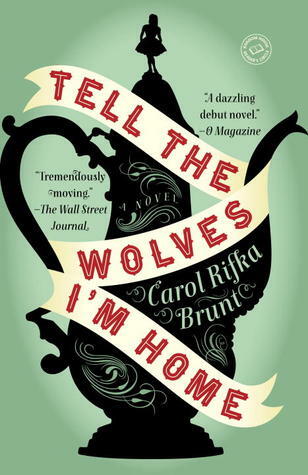 From the moment I saw this book in my sister's car, I desperately wanted to read it, but she told me I was explicitly banned from stealing, Tell the Wolves I'm Home by Carol Rifka Brunt before she'd had a chance to read it. I put it off, since I had a pile of library books to tackle in my own time, but this summer at a lake house in Maine I woke up before everyone else and found the cover beckoning to me from our host's shelves. I started Tell the Wolves I'm Home without knowing any part of the story. I hadn't read the back, hadn't studied any reviews... heck, I hadn't even put it on my "to read" list. I just sat down with a whoopie pie (hello, vacation breakfast) and a steaming cup of coffee, curled up in a chair and started reading. This story of a family torn apart by their own love for each other will make your heart hurt, and the description of the novel doesn't do it justice. Simply put, I wept. I don't remember the last time I read a book that made me leak tears like a faulty kitchen faucet, but I sat in a chair in the light of a Maine morning and let tear after tear fall into my lap. Maybe it was the similarities to my own family history that tugged at my tear ducts, maybe it was the power of the prose, but I felt as though I was walking through an exploration of the author's multi-faceted self reflected in each character. Have you read Tell the Wolves I'm Home? Is it on your to-read list? What did you think? Let's discuss.